Re-Logic is an independent game development studio, having developed Terraria as well as an earlier fan-game, Super Mario Bros. X. Re-Logic is also a publisher of the side-scrolling real-time strategy video game Pixel Piracy and the turn-based strategy video game Pixel Privateers. The company is located in Indiana, USA. Andrew "Redigit" Spinks is the creator of Terraria and President of Re-Logic. Before Terraria, he was the lead developer of Super Mario Bros. X. In February of 2012, he announced he was quitting development of Terraria, but came back in January of 2013. He originally moved on from Terraria early in the development of the 1.3 update to start looking into new coding languages for his next project, however he later continued working on Terraria again until 1.3 was finished. As of the 1.3 release, he almost entirely focused on Terraria: Otherworld (which was later in 2018 confirmed canceled), but once more again returned to work on Terraria for the 1.3.5  and 1.3.6  updates. 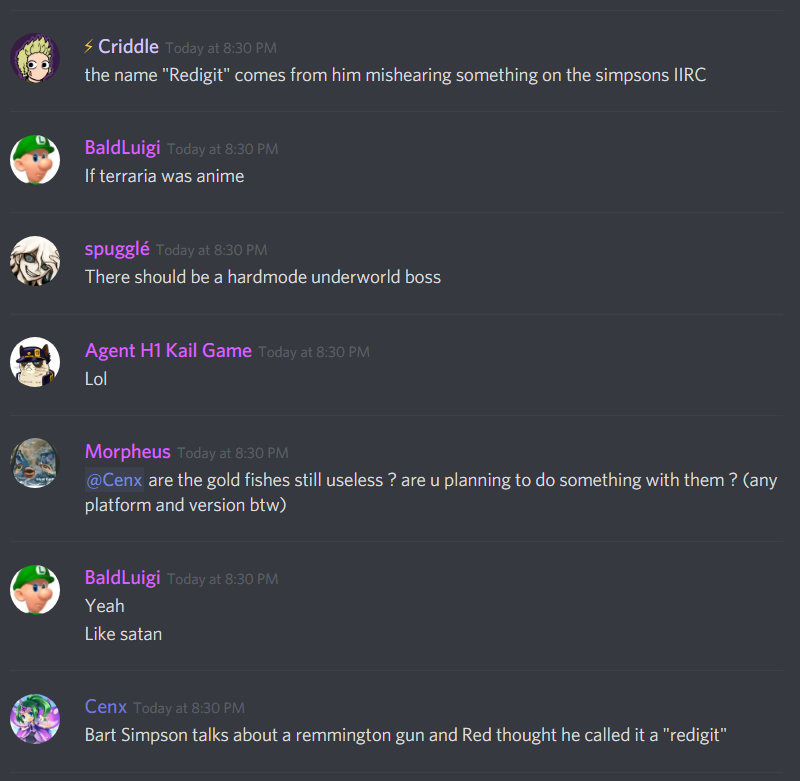 The name "Redigit" originates from the animated American sitcom The Simpsons where the son Bart Simpson talks about a Remington gun. Spinks misunderstood this as "redigit". Whitney "Cenx" Spinks (née Whitney Baird) is the Vice President of Re-Logic, Lead Developer and Game Designer of Terraria and Redigit's wife. David "D-Town" Phelps is the Business Director at Re-Logic. Ted "Loki" Murphy is the Head of Business Strategy & Marketing at Re-Logic. He was originally hired as Re-Logic's Community Manager during 1.3's development, until Safemanda took over as Community Manager in November 2015. Before being hired he was a moderator of Terraria Online. Amanda "Safemanda" Powell is the Community Manager at Re-Logic, and also does admin work and communications. Houston "Food Barbarian" Lawson is one of the Production Assistants at Re-Logic and Redigit's best friend. Yorai "Yoraiz0r" Omer is one of Terraria's programmers and a Lead Developer of Terraria since 1.3. He was hired alongside Solsund in January 2014. Prior to that, he was a well-known modder of the old official forums, Terraria Online. Chris "Skiphs" Bednarz is one of Terraria's programmers and web developers. He is developing Terraria's revamped website and forum, as well as Terraria ports for Mac and Linux. When Solsund left Re-Logic and the ports were essentially done, he was moved up to work on Terraria full-time. Prior to this he was a modder. Victor "Crowno" Moura is one of Terraria's sprite artists and the Lead Artist of Re-Logic. Jim Tommy Myhre "Jimmarn" Kjexrud is one of Terraria's sprite artists. He was one of the sprite artists for Terraria hired for the 1.2 Update. Jamison "Lazure" Hayes is one of Terraria's sprite artists. Olivia "Arkhayla" Cres is the Quality Director for Terraria, in charge of making sure new content is tested before being released. Jason "Leinfors" Parker is part of the Quality Assurance team at Re-Logic, working for Arkhayla. Prior to this he was a beta tester and moderator of the Terraria Community Forums. Crystal "Ghostar" Ironheart is part of the Quality Assurance team at Re-Logic, working for Arkhayla. Prior to this she was a beta tester and moderator of the Terraria Community Forums. "0x33" is part of the Quality Assurance team at Re-Logic. Prior to this he was a popular Terraria streamer. Atri "m4sterbr0s" Maharaj is a Beta/QA Tester of Terraria. Before Terraria he worked with Red on developing SMBX. Mike "TrinityFlash" Dunn is a Beta/QA Tester of Terraria. William "Ignoritus" Coffey is a Beta/QA Tester of Terraria. Before Terraria he worked with Red on developing SMBX. Valtteri Nieminen is a Beta/QA Tester of Terraria. Before Terraria he worked with Red on developing SMBX. Ryan "Namyrr" Le is a Beta/QA Tester of Terraria. Before Terraria he worked with Red on developing SMBX. Brandon "rbrandon" Kime is a Beta/QA Tester of Terraria. Aled "Baih" Kane is a Beta/QA Tester of Terraria. Brian "Blahblahbal" Hansen is a Beta/QA Tester of Terraria. Michael "Kelp" McCarthy is a Beta/QA Tester of Terraria. He also is a moderator of the Terraria Community Forums and a former moderator of TerrariaOnline Forum. Adrian "Unrealmegashark" Wheeler is a Beta/QA Tester of Terraria. Matthew "Omnir" Hunnicut is a Beta/QA Tester of Terraria. Tsukina "Tsuki" Nakata is a Beta/QA Tester of Terraria. She also is a moderator of the Terraria Community Forums. Gabriel "Suweeka" Gutierrez is a Beta/QA Tester of Terraria. Joshua "scizor300" Wubker is a Beta/QA Tester of Terraria. Michael "shockah" Dolas is a Beta/QA Tester of Terraria. Tyler "BurnZeZ" Whiteman is a Beta/QA Tester of Terraria. Peter "Doylee" Doyle is a Beta/QA Tester of Terraria. He also is a moderator of the Terraria Community Forums. Kyle "Kley" Hodge is a Beta/QA Tester of Terraria. Before Terraria he worked with Red on developing SMBX. Steven "Twitchy" French is a Beta/QA Tester of Terraria. Anodomani is a Beta/QA Tester of Terraria. Igor "Conker" Magi Marinho is a Beta/QA Tester of Terraria. Before Terraria he worked with Red on developing SMBX. Cheah Jun Siang is a Beta/QA Tester of Terraria. Zach "Olink" Piispanen is a Beta/QA Tester of Terraria. Lisa "Lils" Chiu is a Beta/QA Tester of Terraria. iRandomness is a Beta/QA Tester of Terraria. Elias "Elbow" Naddaf is a Beta/QA Tester of Terraria. Kaleb "JesusLlama" Regalado is a Beta/QA Tester of Terraria. Jonathan "FallingSnow" Poholarz is a Beta/QA Tester of Terraria. Before Terraria he worked with Red on developing SMBX. Brandon "Reborg" Thomas is a Beta/QA Tester of Terraria. Daniel "DMF" Faria is a Beta/QA Tester of Terraria. Luna Meier is a Beta/QA Tester of Terraria. Robert "qig" Buchanan is a Beta/QA Tester of Terraria. Before Terraria he worked with Red on developing SMBX. Alexaunder "as303298" Savoy is a Beta/QA Tester of Terraria. Alexander "Vandarx" Reaves is a Beta/QA Tester of Terraria. Before Terraria he worked with Red on developing SMBX. QEM - "Mystery" is a Beta/QA Tester of Terraria. Balázs "Mamaluigi" Makai is a Beta/QA Tester of Terraria. Daniel "Garro" Berner is a Beta/QA Tester of Terraria. Before Terraria he worked with Red on developing SMBX. Tyler "Quill" Warr is a Beta/QA Tester of Terraria. Before Terraria he worked with Red on developing SMBX. Andrew "Andydark" Windmiller is a Beta/QA Tester of Terraria. Before Terraria he worked with Red on developing SMBX. Charles "Grox" Hanrahan is a Beta/QA Tester of Terraria. General Milky is a Beta/QA Tester of Terraria. Chris Ness is a Beta/QA Tester of Terraria. Yrimir is a Beta/QA Tester of Terraria. He has his own YouTube channel where he used to post videos of Terraria and other games. He is a well-known modder. Jeremy "Blue" Guerrette was the Production Assistant at Re-Logic during production of Terraria from Jan. 2011 to Sept. 2011. He is no longer affiliated with Re-Logic. Before Terraria he worked with Red on developing SMBX. Jason "Solsund" Berg was one of Terraria's programmers. He was hired alongside Yoraiz0r in January 2014. Prior to that he made "MoreTerra", which is a Terraria World viewing program. He decided to leave Re-Logic in August 2014, after months of struggling to try and balance work and family. Finn "Tiyuri" Brice was the main Sprite Artist for Terraria until around January 2012. He is now the founder and current owner of independent game studio Chucklefish Games and thus no longer affiliated with Re-Logic. Gabriel Henrique "Red Yoshi" Kiesshau was a Sprite Artist of Terraria. Not much is known about him, as he left the Terraria team for unknown reasons shortly after release. Before Terraria he worked with Redigit on developing SMBX. Dustin "Splugen" Gunter was one of the Production Assistants at Re-Logic. Aaron "AaronC" Craig was one of the sprite artists for Terraria hired for the 1.2 Update. He left the team in early 2014 because according to him there wasn't anything else he needed to do. Will "Phlebas" Garner was one of the sprite artists for Terraria hired for the 1.2 Update. He left the team for unknown reasons around April 2014. William "Waffles" Data was one of the sprite artists for Terraria hired for the 1.2 Update, but he left the Team later due to unknown reasons. This page was last edited on 14 April 2019, at 10:30.